Call us today for pediatric dentistry! For the best pediatric dentistry services in the Laredo, TX, choose Dr. Felipe H. Esparza. Our children's dentistry office goes above and beyond for our patients. Getting your children to go to the dentist can be a not-so-simple-task. Everyone needs their dental examination every six months, especially kids. That’s why our children’s dentistry office makes it simple and fun for their patients. Pediatric dentistry requires a caring, fun and friendly environment which is exactly what we have here in Laredo, TX. We have tools and techniques adapted from hospital dentistry here at our practice. With conscious sedation for and oral surgery, our techniques keep children safe and comfortable during their visit. Dr. Felipe H. Esparaza has pediatric dentistry expertise and specialized training to make your child’s dental examination an enjoyable experience, rather than a dreaded visit to the dentist. At our children's dentistry practice, parents, kids and caregivers are treated with the highest level of respect, and with great quality service. Our goal is to prevent all dental problems so that oral surgery won’t need to come into play. If so, we have the lengthy expertise and equipment such as conscious sedation to perform these types of hospital dentistry services. Our pediatric dentistry office provides services for children through teens with routine dental exams that include oral exams, x-rays, fluoride treatments, fillings and more. We do all that we can to prevent gingivitis and gum disease in children and provide them with a foundation to carry on good oral health through their adult lives. We offer special care services for children with special needs, including those who have a cleft lip or cleft palate. We offer conscious sedation and oral surgery as part of children's dentistry! 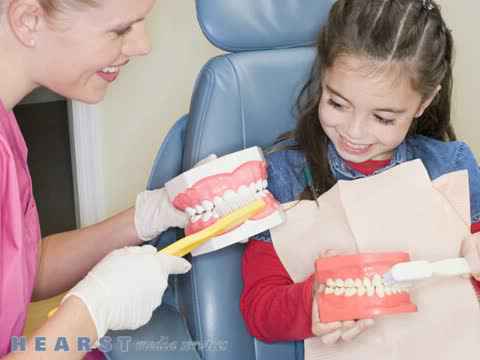 We offer comprehensive children's dentistry. We use the latest technology to provide an accurate diagnosis of any dental or oral conditions your child may have. We serve patients in Laredo, TX and the surrounding areas. If your child is suffering from a toothache or complains about pain in their gums, we can provide the right treatment. We will make sure your child is comfortable throughout the procedure. Make an appointment with us today for children’s dentistry. We work hard to prevent and diagnose any dental problems before they grow. At our children's dentistry office in Laredo, TX, we care about every dental examination we perform. We go the extra mile to make sure a child’s fear and anxiety of the dentist can disappear. For children with crippling anxiety, we do offer the option of conscious sedation. Bringing your child to a pediatric dentistry office at a young age is very important. If children learn about proper dental care and cleaning habits early on, those habits are more likely to remain with them through adulthood. Children's dentistry needs are different from those of adults, so a pediatric dentist is best able to equip your child with the services and habits he or she needs. At our pediatric dentistry office we provide an honest, caring, friendly and compassionate environment. This allows for a successful visit and treatment. We utilize diagnostic tools, conscious sedation, protective stabilization and hospital dentistry for the 100% success of every treatment plan. Keeping children's teeth healthy is our mission at the dental office of Dr. Felipe H. Esparza. We provide both general pediatric dentistry services as well as more complex oral care procedures. Call us today to schedule an appointment for your child. When you are in need of hospital dentistry, we are here for you. At the offices of Dr. Felipe H. Esparza DDS, we understand that accidents happen. Whether your child was running and fell, knocking a tooth out, or is experiencing other tooth pain after normal dental office hours, our pediatric dentist is here for you. Dental emergencies are stressful situations, especially when your child needs oral surgery for any reason. Often we don't know what to expect. Our pediatric dentistry experts are here to put your mind at ease, as well as your child's mind. Ask us whatever questions you need to about your child's hospital dentistry experience - rest assured that we will put our considerable knowledge and experience to work making sure that your child's procedure goes according to plan. With Dr. Felipe H. Esparza working for your child's pediatric dentistry needs, you can have peace of mind. For emergency or more complex dental procedures, our hospital dentistry services are perfect. We also offer conscious sedation for patient comfort. Your child will sit through their dental procedure safely and without any fear or pain. Here at the pediatric dentistry office of Dr. Felipe H. Esparza DDS, we evaluate the child’s needs and the parent's concerns to make sure that our children's dentistry services are just what you need. In doing so we want to make kids smile with fun, educational treatments during every dental examination and visit. Our services offered at our Laredo, TX children's dentistry office are meant to keep your children’s teeth healthy. Whether it is oral surgery or a regular dental examination, we have you and your child covered for a happy, healthy visit; our techniques and training in hospital dentistry help you get through your visit hassle free. Visit our website for all the information you need on our pediatric dentistry services! We also accept payment through Cash and Most Insurance. Dr Felipe H Esparza DDS provides pediatric dentistry in the Laredo, TX area. From regular dental exams to oral surgery, the team at Dr Felipe H Esparza DDS is second to none. Does your little one need braces? Dr Felipe H Esparza DDS offers orthodontic services and more. He even understands the needs of children with special needs. The dentist will evaluate facial development in children with special needs as well as perform a hard neck evaluation. When your child is in need of oral surgery, Dr Felipe H Esparza DDS offers conscious sedation. In case of an emergency, he also provides hospital dentistry. Call today for all of your dental needs.